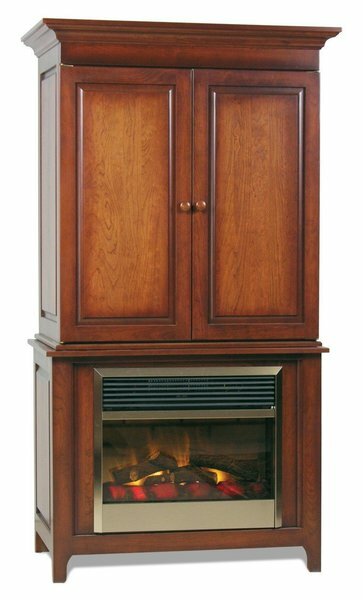 Tall and stately, this exceptional solid wood fireplace entertainment center is designed to pack as much functionality into its frame as possible. The doors on the hutch provide a perfect way to convert the Lancaster from entertainment center to fireplace when the television isn't in use, while the electric fireplace itself offers year-round heating options and beautiful lighting that adds lasting ambiance and warmth to any space. Perfect for gathering the family round for movie night and keep the cold at bay, the Lancaster Fireplace Entertainment Center is as much a hearth as it is a TV cabinet. Your Lancaster Fireplace Entertainment Center will be handcrafted from your choice of wood and stain in a small Amish woodshop in the northern United States. Simply select your perfect materials from the menus above to get started. If you've any questions at all - or if you would like to see samples of our woods and stains for no charge - please don't hesitate to reach out to us by phone or by email. We love the way the Lancaster combines the family hearth with the family entertainment center, and we'd love to talk with you about what it brings to the home. Note Please Call For Pricing on Ordering Without Hutch Top. Other Wood Choices Available Please Call for Pricing.